To all my American friends loving the fireball on the stateside it’s called firewater. That’s probably why you have such a hard time finding it. I love to mix it with doctor pepper. Tastes like a cherry Cola. Mix it with Dr. Pepper and it is like sipping Red Hots. I can’s get enough of it. Dude great writing/presentation! Fireball Whiskey rocks! I went to pick up some Maker’s Mark. At the cashier I saw a miniature of “Fireball” for a buck. It intrigued me, so I bought one. Got to the car, cracked it open, drank it before I left the parking lot, was laughing/giddy. Haven’t stopped since. Bought 1.75L bottle. It’s like drinking a melted jaw breaker fireball. Amazing! I tell everybody I know about it. We keep a bottle of Fireball in the freezer. It only comes out to get passed arround the room cowboy style. (Straight pulls from the bottlepassed around the room) Immagine all the good things you said about FB. And add TAKE YOUR BREATH AWAY REFRESHING. Trying this out for the first time. 5 shots in, I feel like Tonya the Tiger. Greaaaaat!!!! I just purchased a fifth of this stuff the other day. I am currently keeping it in my freezer and have already poured a glass last night. All I have to say is wow. That stuff is really good. Just try it ice cold in a highball glass, sip it slow, let it burn all the way down. This is now my favorite whiskey to sip. American Irish Car Bomb — Fireball cinnamon Whiskey with a splash of Bailey’s Irish Cream in shot glass and then drop into Guiness. If you really like hot chocolate with cinnamon try putting a shot or two of fireball in your cocoa. It taste so damn good. Try mixing 50/50 with Jack Daniels Tennessee Honey. Straight Jack is okay but the honey takes a bit of the bite out. Great stuff. Jim regular cherries or maraschino? Fireball + Rumchata + Pumpkin Pie Vodka. I’ll be serving these up with dessert this Thanksgiving. I soak cherries in fireball for two weeks then freeze them and use them as icecubes in almost every drink I mix beleve me its awsome! That’s great that you’re willing to share with the world that you slam whiskey in your car. I’m assuming you had someone else driving. Does anyone have recipe for Fireball cupcakes? I made an apple pie with it. YUMMERS!!!! I drink Fireball Whisky at my local J.D. Wetherspoon’s pub in Rotherham, South Yorkshire, where they serve it with apple juice, and it is the nicest stuff you can imagine. It’s just a shame the company’s made their website inaccessible to people who have to use cell phones to get online. Nice! Try Fireball, Groschlager and Gin (shot measures) and drop a shot glass of Jagermeister into the glass and chug! Sickly but nice. Havent tried it as a long drink, but would probably work nice with lemonade! Just read the article it’s great overview of the liquor. I keep mine in the freezer and it makes it 1000 times better. Fireball is huge in my town and I’ve tried it several ways, but I suggest it straight out the freezer! Enjoy resonsibly y’all! VERY GOOD TOO . SWEET LIKE CIONON I LIKED THAT SOMTHIME DIFFRENT IN A WISHKSY DONT FIND LOT WISHSKY FLOVER THE THIME . I have also heard that if you cut up a couple of apple’s and soak them in fireball over night you’ll have an awesome snack. Add straw. Drink. Life altering. I stopped by the liquor store last night for a much needed refreshment, and the little box of devil’s were sitting on the counter and looked rather cute…I thought, what the hell and bought a bottle. It is awesome! It is exactly like eating an atomic fireball. I’m going back tonight for some more. I’m torn though because it would probably be more cost efficient to buy a big bottle…but those little bottles are so much fun! The last time I drank fireball was almost 8 years ago, I only had a shot it was my only time. Got a pint just wasn’t sure if I was to mix it or not. Remember it not being that strong and had a really nice glow (I should also note I am Canadian and I remember it kept you warm which I know almost any liquior does eventually thought it was ironic that a Canadian made it for frost bite ect). Anyway nice post Jimmie. Gonna crack er open. Drink Safe…..
I’m in college. Over 21. Everybody who strolls through the door loves this stuff…I am never without a bottle in the freezer. Shotglasses were made for Fireball. Mix it with apple pucker, ginger ale and a splash of pineapple juice. 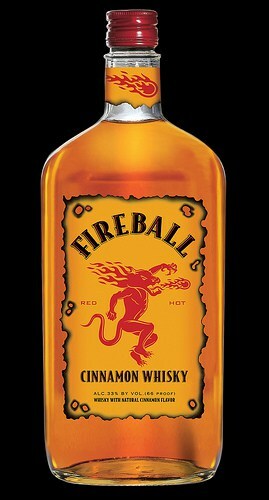 #2 Fireball is amazing, i cant find it in any liqour stores in NYC. Ordered 2 750 ml bottles online for NYE. I will be a hero at this party. OMG. Someone asked me the other night (in a bar, big surprise) if I’d ever heard of Fireball whisky. I said no…..but sign me up! This stuff is the shizzle…..especially ICE cold. They pulled the bottle out of the freezer before pouring it in shot glasses. I haven’t found it yet in my local grocer, but I was told it’s sold all kinds of places. I feel like a kid who found something new and awesome good. THANKS, Jimmy…..!! Thanks to this review I finally nabbed the lone bottle of Fireball I’d been eying at the local package store for about a week. This stuff is amazing. I feel like a kid again. A kid getting soused off liquid Atomic Fireballs. mixed with unfiltered apple cider served warm……..all I can say is YUMMMMM!!!!! I must have some of this! BevMo has it on sale for $16.99… I will head straight there after work for sure! Great review! Great stuff, try mixing it with apple cider, or a splash to any drink you want a cinnamon hint. Made my day a little better reading this tahnk you.